Last weekend while attending the Weston A Price Foundation's 2009 Wise Traditions conference, we were delighted to see a wide array of healthy food offerings. There were many fermented products, and naturally one of the most prevalent was fermented cabbage, or sauerkraut. The lunch on Saturday was served in buffet style and it was hard to choose with what to fill one's plate. Fortunately for my palate the first option was a sauerkraut that I had never encountered before. I say fortunately because never in my life have I ever tasted a better kraut. While I can only guess at the ingredients my impression of it would describe it as an "Apple Cinnamon Sauerkraut" -- strange, but delicious. With that in mind, I would like to remind you about your vegetables, and how eating them can really keep the doctors - and their drugs - away. Cabbage, in particular. It's such a plain, boring vegetable if you just look at the raw produce. I'll readily admit and agree with that. But it is, to me, practically the soul of umami - that strange fifth sensation that is hard to exactly describe. A cup of raw, shredded cabbage will give you calcium, phosphorus, iron, sodium, potassium, vitamin A, vitamin C, and a little B-complex. It also has a high amount of sulphur - an often overlooked mineral. 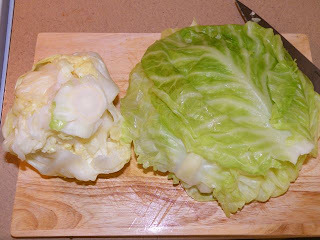 At least, until the cabbage is digested, of course; most people are probably familiar with its sometimes-inconvenient but natural after effects! But sulphur is very good for you; members of the Brassica family such as cabbage, brussels sprouts, cauliflower, and broccoli inhibit the growth of harmful chemical carcinogens within the body. That's right. That means anti-cancer. If that miraculous property of cabbage weren't enough to make it a daily staple of your diet, it is also been determined to neutralize toxic effects of excess cobalt, nickel, and copper in your body. It lowers serum cholesterol, calming agitated nerves and anxiety - thus it's an anti-depressant and can help you get to sleep at night. Oh, and cabbage is also effective at breaking down stools. But we're not done yet. Cabbage juice, and fermented sauerkraut juice has been recommended to help expecting women get over their morning sickness very quickly. It's a fantastic and natural antacid - much cheaper and more natural than over-the-counter ulcer/heartburn medication. It has even been verified in treating hangovers. Now is a great time to look to some old-world recipes for solutions to new-world problems. Bring on the borscht and sauerkraut! For more information, read John Heinerman's Encyclopedia of Healing Juices. This post is part of Prevention Not Prescription Tuesdays on the Kathleen Show. According to old Irish wisdom, sauerkraut is good for the complexion as well. I've found this to be true. If you eat naturally fermented sauerkraut before going to bed, you just might wake up with a fresh rosy glow. But the pasteurized kind you often find in the store doesn't have the same effect. It has to have all the beneficial bacteria in it from the fermentation process. Uh oh. Looks like I may need to reconsider cabbage and sauerkraut...have never ever been a fan. I can totally get on board with more chocolate for my antioxidants, but cabbage? That'll be a bit more difficult!